Our next stop was a little north of Lakehead where several creeks, a river, local and state highways, and the Union Pacific Railroad all came together. In the photo above (courtesy of AARoads) we see the abandoned Dog Creek (Harlan D. Miller) Bridge, a tall arch bridge built in 1927 which carried U.S. 99 before it was replaced by I-5. To the left is the U.P. 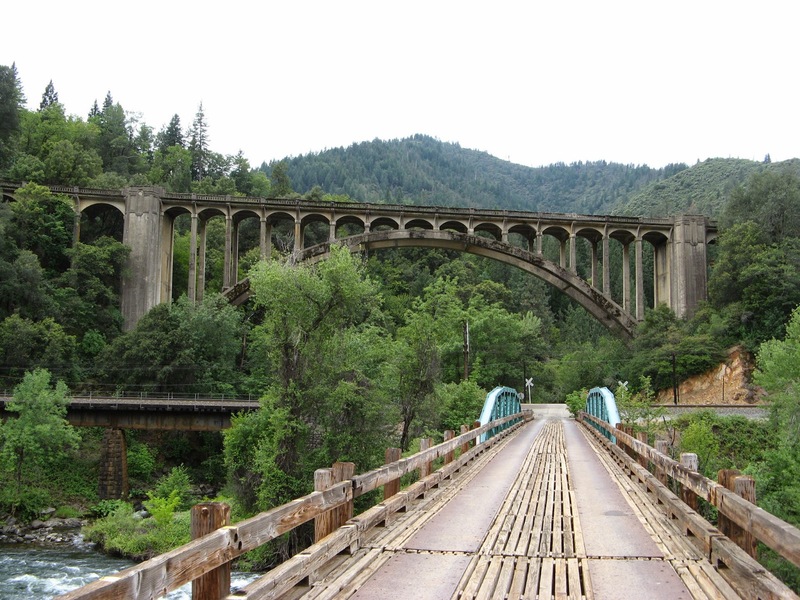 Dog Creek Railroad Bridge, which is a continuous, two span plate girder bridge on a stone masonry pier and concrete abutments. We're standing on the Fender Ferry Bridge, a steel pony truss bridge with a timber deck over the Sacramento River. Shasta County, California Bridges: Dog Creek Bridges by Mark Yashinsky is licensed under a Creative Commons Attribution-NonCommercial-NoDerivatives 4.0 International License.